The Amigo Petite Cozy stable rug has an outer layer of breathable 600D polyester and the inner layer has a polyester lining. The blanket is padded 350g and not waterproof. The Amigo Petite line is specially made for mini horses. 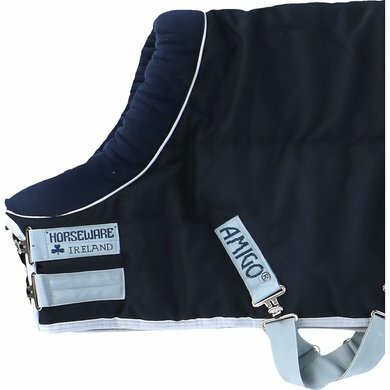 The blanket has a sturdy fleece collar, has a double chest closure and cross surcingles. Very nice blanket. 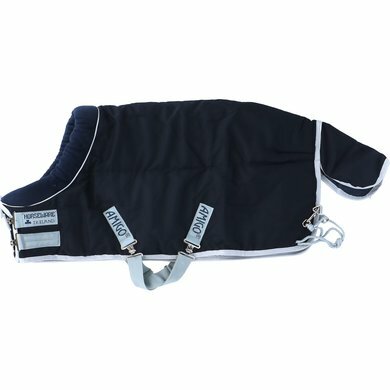 Does my Shetlander fit exactly, does not fall too long. With the collar it looks chic. Fine stable blanket.